Clear unwanted grass, thatch and moss build-up so your lawn can breath and grow. Thatch is the straw-colored fibrous layer that's a natural part of a healthy lawn -- each year the lawn grows and dies back. But over time, when thatch builds up more than half-inch deep, it starts strangling the lawn. So that's when you bring in the dethatcher, or "power rake" as it's called by rental insiders, for its ability to pull out and cut offending debris, and make space for new grass shoots to grow. From our perspective, dethatchers are a first step on the path to maintaining or rejuvenating a lawn's health. Plus, in wet climates like ours in Portland, a dethatcher is helps keep the moss from taking over. Back to topinc -- Along with the aerator, the dethatcher is one of two rental tools that can bring a tired lawn back to health. It's a heavy machine, which is important, because the weight helps the machine maintain good contact with the thatch and moss layer, and makes it more stable against surges and stalls as it does it's heavy work -- What you don't see beneath the engine and hood is a reel of flails that help propel the machine forward as they rip through the thatch. It's not self-powered, but pretty close to it. A lot of people think that you should dethatch your lawn every couple of years. 13,000 square feet per hour. Why do I need to thatch my lawn anyway? There are a number of reasons, but mostly it boils down to the fact that when thatch -- or dried grass stems and roots -- builds up, it essentially blocks air, water and nutrients from reaching the soil. So there's a practical reason in terms of lawn health. Also, there's a cosmetic purpose, in that lawns heavy with thatch tend to get patchy and less attractive. It really has to do with the condition of your lawn, but a rule of thumb is that you should power-rake your lawn if dried-looking thatch build-up is more than a half-inch deep. Is there a best time of year to thatch my lawn? Depending on your climate, most professionals recommend using a dethatcher in the fall or spring, stretching into the summer in some cases. Keep in mind that dethatching is a pretty aggressive step and can damage some healthy grass in addition to taking out unwanted thatch -- so you need to allow at least a month or so of the growing season for the lawn to rebuild itself to full health. 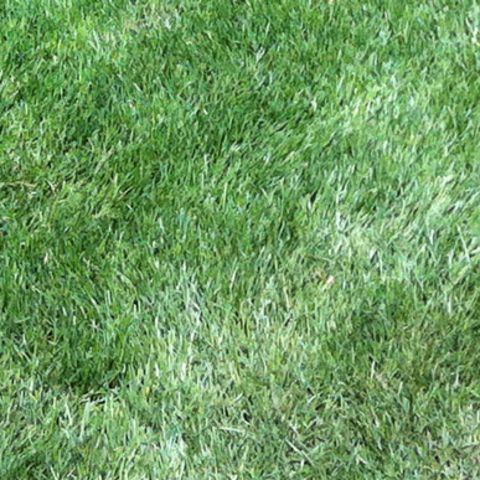 growing season left for your lawn to recover. 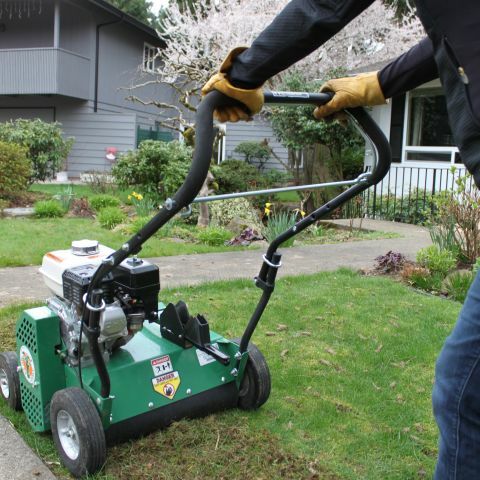 Basically, running a dethatcher over a lawn is like running a hair brush through snags of hair -- a reel of "flails" whips through the grass to separate grass stems and above-ground roots that have grown so thick that they hinder healthy lawn conditions. Maybe. At 160 pounds, this is one of those "tweeners" that is possible to fit into the back of an SUV -- but also is possible for you to throw your back out doing so. Ramping it into a pickup or trailer is a more reasonable approach. 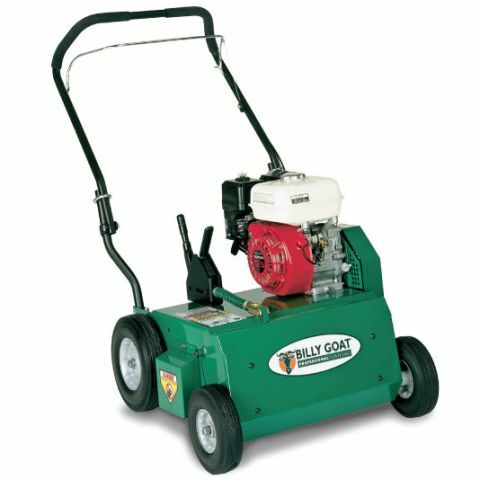 How can I tell if I need to de-thatch (power rake)? Take a core sample of grass and soil from your lawn. Measure the organic material sitting on the surface of the soil. If it measures near ½ inch, you should power rake. Thatch is a layer of living and dead organic matter that occurs between the green matter and the soil surface. Excessive thatch (over 1/2 inch thick) creates a favorable environment for pests and disease and an unfavorable growing environment for grass roots. When should I power rake? Power rakes and lawn aerators are not substitutes for each other though lawns do experience some common benefits. 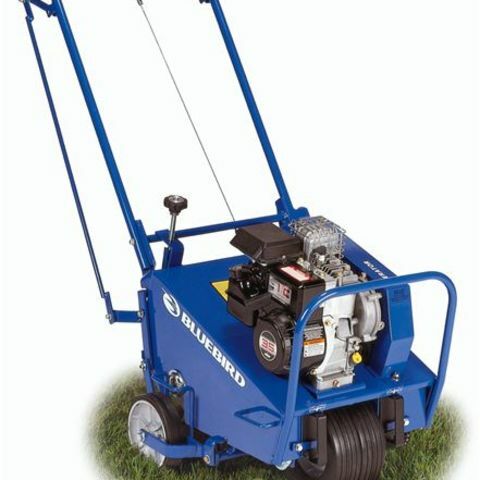 A power rake removes excess organic debris from the lawn. 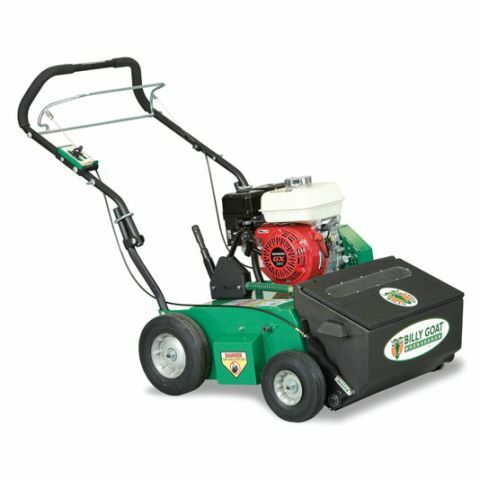 Lawn aerators are meant to reduce soil compaction and improve grass root development. How do I get the best results from the power rake? Soil should be moist. 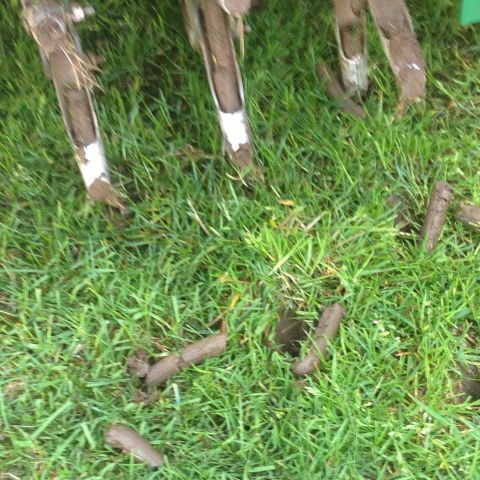 If the soil is too wet the grass could pull away. Best results are achieved when working in two directions. Adjust the depth of the flails under the power rake so that they make contact with thatch. The flails should not make contact with the soil. Collect thatch immediately. 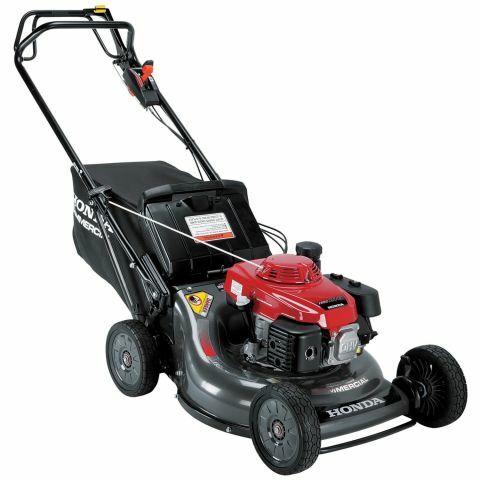 Mow your lawn a little shorter than usual before you use a dethatcher rental. Water the lawn lightly the day before you plan to thatch -- the soil should be moist but not mushy. Always inspect the work area prior to firing up the power rake -- remove any rocks, wire, cable or string that could be a safety hazard or get caught up in the dethatcher rental "flails." Identify and mark all objects that might damage the equipment or be damaged if they were to come in contact with the dethatcher rental's flails. Sprinkler heads are the biggest concern in most yards. DO: Clean up loose thatch right away -- otherwise it will settle back into the lawn, and your hard work will be wasted. DO: The soil should be moist, but not too wet, or the dethatcher rental will pull the grass from the soil. For best results, work in two directions in a sort of cross-hatch. DO: Criss-cross the lawn. Plan on making at least two passes over the entire yard. DO: Go to work on the grass thatch, not the soil. As you begin, make sure that the power rake isn't set at a depth that it removes thatch but doesn't go so deep as to scratch the soil. DO: Approach your dethatching project with a Safety First attitude. Wear protection for eyes, ears, hands a feet, and NEVER reach under the machine while it is running. DO: Identify and mark all fixed objects to be avoided while using the dethatcher rental, paying special attention to sprinkler heads, water valves and shallow-buried cables or lines. DO: Rake up thatch immediately after dethatching the lawn. DO: Test and set the depth of the dethatcher rental's flails -- which should remove grass thatch but not come in contact with the soil.